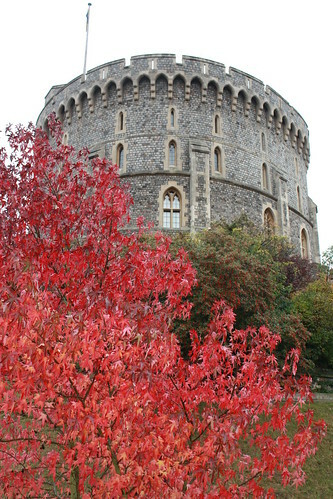 Windsor Castle is often considered a London attraction, though it is located 22 miles (35 kilometers) from Buckingham Palace. Most tourists visit Windsor by taking the train. The castle is about a five to eight minute walk from the train station. 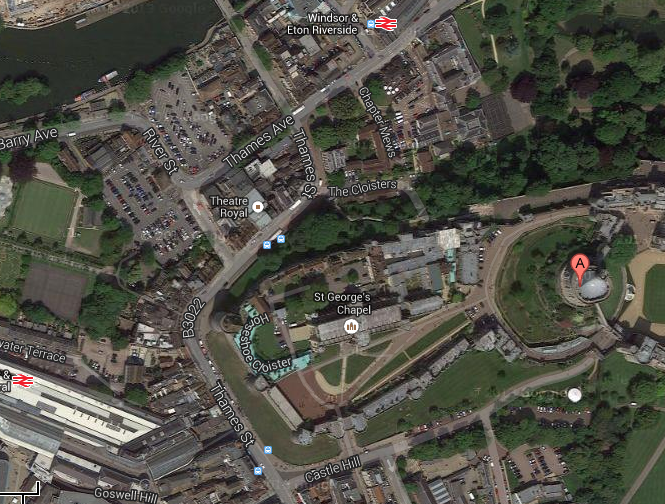 The ticket booth is right across the street from the Henry VIII gate (the exit). Security is a little tighter here than other tourist attractions as it is a current home of the monarch. You will go through metal detectors, etc. Try to clear security in time to attend the 10:00 AM Castle Precinct tour. Precinct, meaning within the walls of the castle, is a 30 minute tour around the grounds. I was told that the tour ends at the North Terrace. 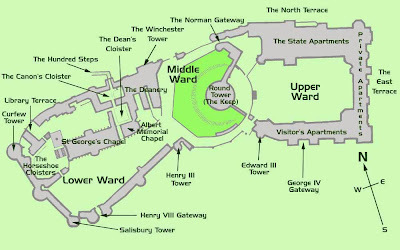 Take a few minutes to look around before heading back down to the lower ward, just outside St. George's Chapel for the changing of the guard. In the winter this does not happen every day, so check the website to make sure we are going on a day that it is scheduled to happen. Also check to make sure the state rooms are open. I read that most people gather towards the Henry VIII gate, where the guard enter. It is best to stay back. 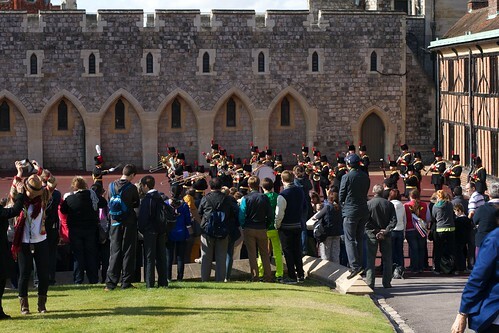 The band congregates near the Horseshoe Cloisters. The changing should last around 30 minutes. From there go straight into St. George's Chapel for a 30 minutes tour. Afterwards head back up to the North Terrace and the entrance to the state apartments. Likely we will only have time for the state apartments and not the Queen Mary dollhouse. We are going to pass on the kitchen tour, do to the expensive, but it looks fabulous. Periodically they have a tour of the round tower, but it is unlikely during March. 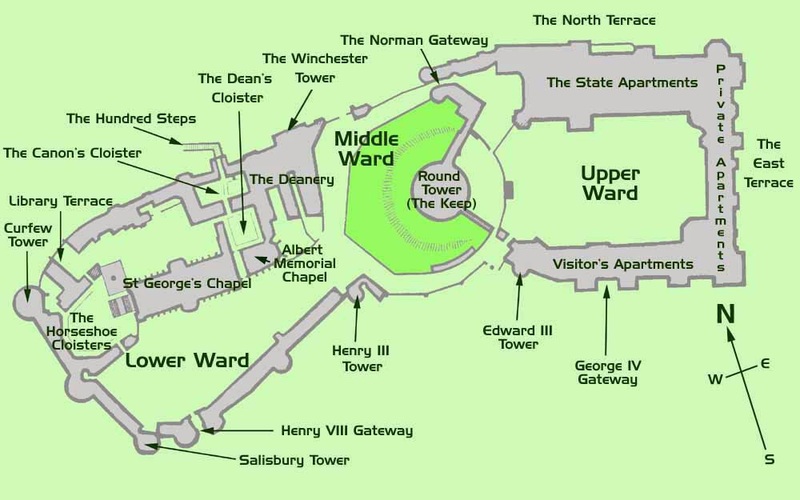 You can get views of the upper ward from where you enter (near Edward III tower) or through the Norman Gateway, there is a parking lot with a gate in which you can snap a few pictures. Afterwards we will head over to the Windsor and Eton Riverside train station to head back to London. (Make sure to see our tips for taking the train to and from Windsor.) While walking to the station look for a street (really a parking lot) called the cloisters. It has a wooden door, but if it is open there are beautiful views of the castle, the gardens and the hundred steps.